We're feeling patriotic today, so we decided to cook a dish deeply rooted in our history. 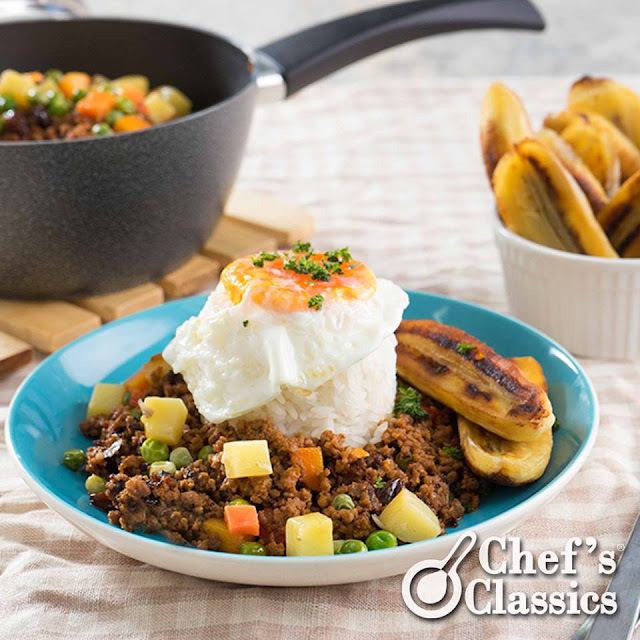 This Arroz ala Cubana recipe has been a hit among Filipinos for decades! Get your phones ready because this dish is Instagram-worthy! 1. In a Melissa Saucepan, saute onion, garlic and tomatoes with the olive oil. 2. When the tomatoes become soft, put in the ground beef. 3. Cook ground meat for at least 5 to 8 minutes or until the excess oil becomes visible. Remove the oil. 4. Pour in tomato paste, soy sauce, paprika, ketchup, salt and pepper. Stir and cover the pan for another 3 minutes. 5. Add chopped carrots, potatoes, raisins and green peas. Cook for 3 more minutes in low heat. 6. Arrange in individual plates with steamed rice, banana and the sunny side up egg.